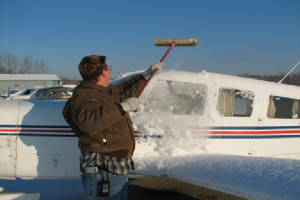 Your full service general aviation mechanic. VERNON CONLY - Chief Mechanic/Commercial Pilot: I have been flying for more than 25 years and have flown many ferry flights around the United States and completed several across the country excursions, including a flights to Alaska from SW Florida in 2004 and 2010. I hold single and multi-engine instrument commercial ratings, seaplane rating and have extensive tailwheel experience. I have been working on small piston aircraft for over 22 years , earning my A & P in 2002 and my IA in 2005. Currently, I own Vernon Conly Air Service in LaBelle, FL where I service piston aircraft and agricultural turbine aircraft for the local community. TERRY CARBONELL - Office Manager/Commercial Pilot: I have been flying for just over 5 years and have earned my single engine instrument rating, commercial rating, tailwheel and seaplane ratings and accumulated over 1600 hours. I have flown to all 4 corners of the United States, Mexico, the Bahamas, Alaska and Canada and participated for the past 4 years in the Air Race Classic www.airraceclassic.org using my airplane, Wild Mama www.teamwildmama.com. When I am not flying, I work for Vern as his office manager. TAD SZYMANSKI - Mechanic/Commercial Pilot: Independently working for Vern, I am an A & P with over 20 years experience; I am also a commercial pilot and qualified glider tow pilot. What's Happening Around the Shop? Our services include annuals; general aviation repair; aircraft; consulting; modifications; electrical trouble-shooting; pre-buy inspections; ferrying aircraft. **NEW** We now weigh aircraft - call for quote.